Outline that metabolic pathways consist of chains and cycles of enzyme-catalysed reactions. Explain how enzymes lower the activation energy of the chemical reactions that they catalyse. 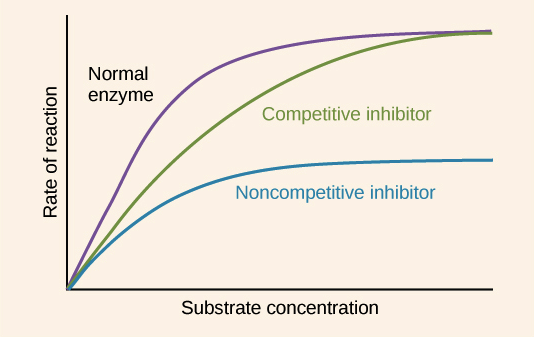 State that enzyme inhibitors can be competitive or non-competitive. 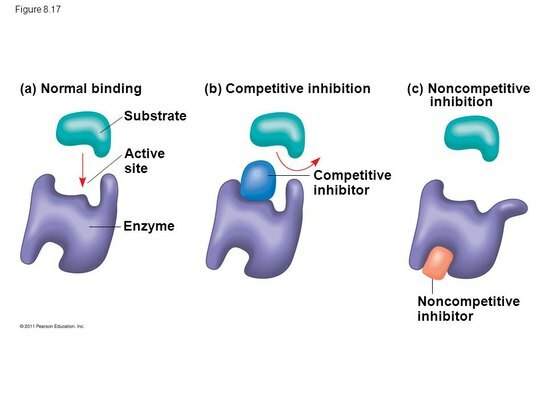 Differentiate between a competitive and a non-competitive inhibitor. State one example of competitive and non-competitive inhibitor. Distinguishing different types of inhibition from graphs at a specified substrate concentration. Explain how metabolic pathways can be controlled by end-product inhibition. Explain the end-product inhibition of the pathway that converts threonine to isoleucine. Explain how databases can be used to identify potential new anti-malarial drugs. Calculate and plot graphs of rates of reaction from raw experimental results. enzyme activity: a measure of the amount of active enzymes present. Your metabolism is the sum total of all the chemical reactions taking place in your cells (eg. digestion, anabolic reactions, deamination, respiration). 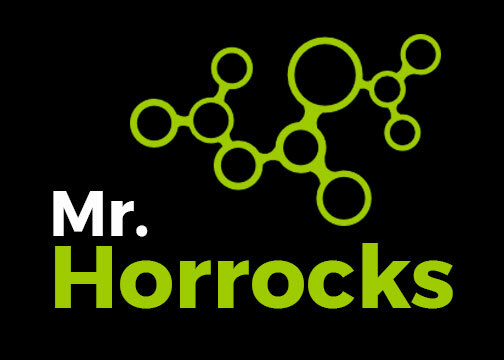 In order control metabolic reactions more carefully, they occur in a series of small steps. This chain of reactions is called metabolic pathway. Each step in the pathway is controlled by an enzyme. +Production of an enzyme will causes step to speed up. -Production of an inhibitor will slow it down. Q) What would be the effects on the levels of A, B, and C of the production of an inhibitor that affected enzyme 2? How do enzymes speed up the rates of reactions? 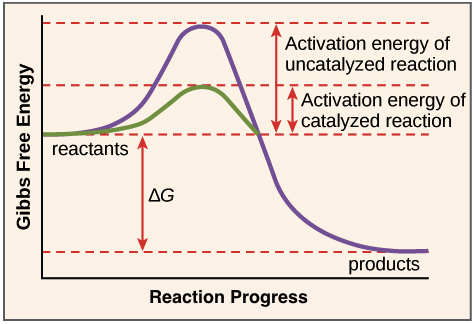 Enzymes speed up the rate of a specific reaction by lowering the activation energy required for the reaction to take place. Note: Gibbs free energy is a measure of how much energy is in the reaction. In the profile, energy needs to be added to make the reaction happen (activation energy). In this reaction, energy is released because the products have less energy than the reactants. Enzymes can be inhibited, or have their activity reduced, by chemical agents called inhibiters. Many poisons are enzyme inhibitors eg. cyanide (non-competitive), and sarin (competitive). A famous example of a competitive inhibitor is agent Sarin. Sarin is a nerve agent which has been used illegally in war and in terrorist attacks (such as in Syria and Japan in recent years). Sarin blocks the enzyme acetyl choline esterase, that breaks down the neurotransmitter acetyl choline after it has crossed a synapse. This effectively paralyses the neural pathway. Sarin can cause rapid loss of body functions such as breathing and even death. 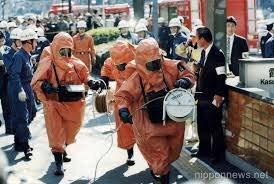 Photograph shows a chemical weapons teams responding to a terrorist attack on the Tokyo subway in 1995. Cyanide, the most lethal of all human toxins, is a non-competitive inhibitor of a respiration enzyme called cytochrome oxidase. If respiration stops, the source of energy for the body is taken away, and this can cause death in quite small doses. 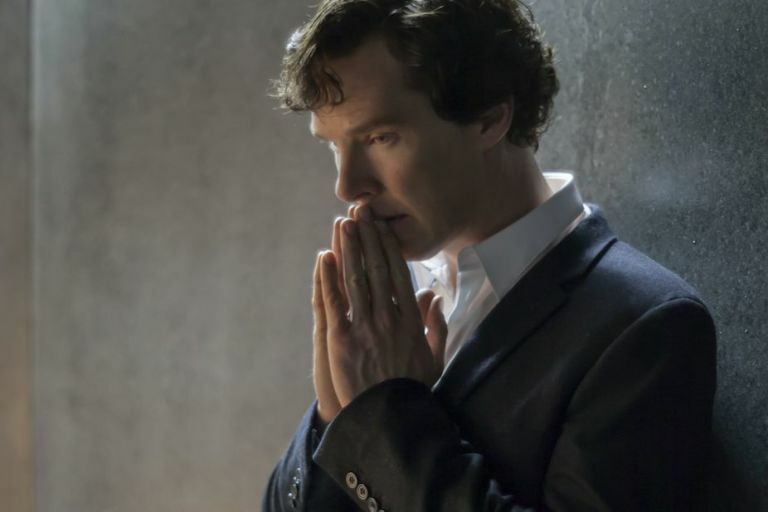 Sherlock Holmes – fictional detective investigated cyanide poisonings in Sir Arthur Conan Doyle’s stories. 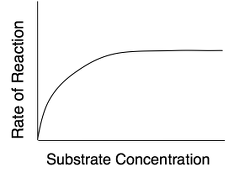 Figure showing the effect on rate of reaction by adding more substrate. Normally, adding more substrate causes an increase in reaction rate until saturation of the active sites starts to occur. When there are no active sites available the rate will not be enhanced by adding more substrate. 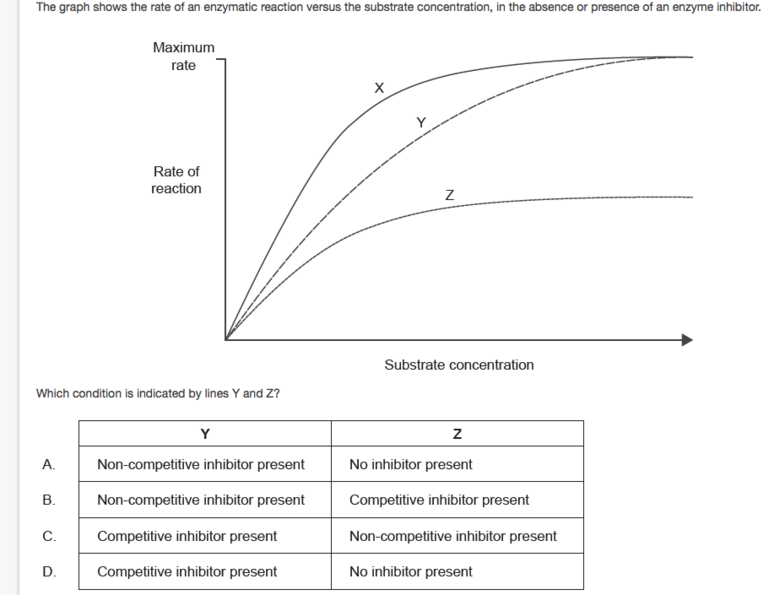 Enzyme inhibitors slow down the reaction rate, but the effect of competitive inhibitors is less damaging as they are competing with the inhibitors; so if the concentration of substrate is really high the inhibitors won’t get a chance to bind with the active site. Non-competitive inhibitors do not bind with the active site, therefore adding more substrate does nothing to diminish their effect of reducing the enzyme activity (amount of active enzymes present). When the metabolic pathway is controlled by the final product, and this is because the final product is an inhibitor for one of the steps, this is called end-product inhibition. An example of end-product inhibition is the conversion of essential amino acid threonine into non-essential isoleucine. Isoleucine is a non-competitive inhibitor for the first metabolic step, and so when it is produced it starts to slow down the reaction. This helps to control the reaction, and retain some levels of threonine in the body. Malaria is a tropical disease that causes powerful fevers to occur in its victims, and causes many fatalities especially in infants and babies. Databases of genomes of the malarial parasite can be used to screen or check for new chemicals that might be inhibitors of metabolism for the parasite (it’s a protist called Plasmodium falciparum). If the chemicals are inhibitors, they may work as anti-malarial drugs. Sometimes, temperature changes can indicate reaction speed, such as in exothermic reactions.